A few weeks ago we invited a homeschool mom and her family to join us for dinner at our house. The children jetted down to the basement to play, while husbands settled down in the family room to talk. As my friend and I worked in the kitchen preparing the dinner plates, our conversation turned to homeschooling, of course! We talked about how we were wrapping up the current school year and then discussed our plans for the upcoming school year. At one point the conversation turned to the topic of homeschool spending and we spent quite a bit of time swapping money saving strategies and discussing budgeting techniques. 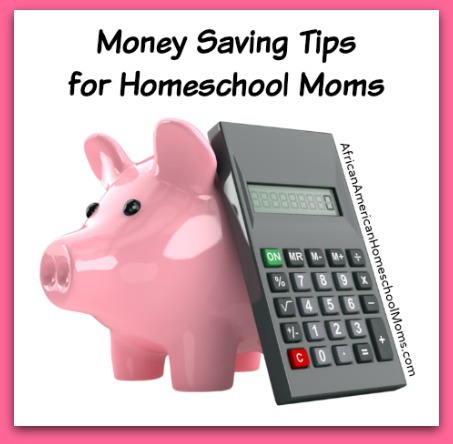 Are you looking for ways to trim your homeschool expenses? Do you want to cut costs, but still enjoy homeschool activities and events? If so, I think you’ll want to know about the money saving tips my friend and I discussed. Purchase used items. Everything you buy for your homeschool doesn’t have to be brand new. I love the end of the school year homeschool curriculum sales that are held in my area because I always find great things at rock bottom prices. I’ve come away from used curriculum sales with books, games, and other educational resources in like new condition. Vegsource is a great online site to find used curriculum and materials. Also, don’t forget to check yard sales, Ebay, and Craigslist. Find online freebies. A strong internet connection and a printer can easily become two of a homeschool mom’s most valuable resources. Before I purchase curriculum, I always look to see if there’s something comparable but free online. I’ve found complete curriculum free of charge online. You can start your search for free resources by checking out the AAHM Freebie page. Spend time in the library. The staff in the Children’s Department of our local library knows us by name because we’re there two or three times a week. In addition to checking out terrific books, I’m also able to check out educational videos and DVDs for use during my lessons. Our library offers many programs and activities which are free for library card holders. And because the homeschool community in my area is so large, they’ve even begun to host educational homeschool programs during the day. Borrow from and share with fellow homeschool moms. Before I make a big purchase, I check with my homeschooling mom friends to see if they have something I can borrow. Sometimes a friend used a certain book last year, but won’t need to use it for another two years. If the book is not going to be used ask if you may borrow it. Use Youtube. I refer to Youtube as as “Youtube University” because there are hours of educational programs and tutorials there. There’s likely a video (or two or three!) for any topic you’re teaching. During this past school year, all my children’s art lessons came straight from Youtube. If you’re concerned about racy ads or inappropriate comments use ViewPure to filter videos before you show them to your children. Shop off the beaten path. While I’m often drawn to shop at the big name retailers, I also shop and find reasonably priced homeschool resources at Dollar Tree, Walmart, Target, and office supply stores like Office Max and Staples. Joann Fabrics is one of my favorite places to shop for homeschool resources because they have a great educational section and regularly offer coupons for as much as 50% off. I’ve purchased posters and even workbooks there. Make the most of gifts. When grandparents and other relatives ask what my children want or need for their birthdays, I always include something educational on the list of suggestions. Relatives can gift children with magazine subscriptions, museum passes, or class fees. When these things are gifted, the giver knows the child has received something useful, the child is happy, and your homeschool spending is reduced. That’s a win for everyone! Homeschooling doesn’t have to be expensive. By using the money saving tips I mentioned and by implementing a few creative ideas of your own, it’s possible to give your child a high quality, enriching, and fun homeschool education without breaking the bank. I certainly hope these tips will help!